Fruit and vegetable carving classes in Russia! Well its not always a routine posting job for me as I have created this blog with a single minded intention to spread word about this fantastic art to all those who love this art. I have been flooded with requests from so many friends and fellow Fruit and Vegetable Carving Artists to portray their work on this blog, and I totally am privileged to do so. This is taking me a lot of time as I have to first compile all their information so as to give them the best leverage and credits for their worth. It is a privilege for me to display these artists who with their fantastic work are doing so much to spread this art around the world. So reading around I came across this wonderful blog where I found that the author also conducts Fruit and vegetable carving classes in Russia, while also doing carving tools and books distribution. I also wish the author Selena Ze Arteest (Elena Tabaeva) all the best in her work, and ventures! 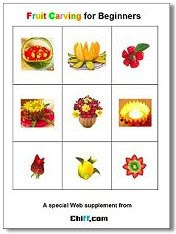 *Over 30 fruit carving projects with step by step instructions, diagrams & full-color photos. *Availability: Instantly downloadable 557K PDF File. So why wait for more time when you can start with the best of instructions for all beginners who adore this wonderful art of Fruit and Vegetable Carving. Wish you all the best, while I look out for some other great information which I have compiled for you all to feast on! Keep a watch for more! And while I get going let me once again wish you all wonderful readers a (Belated) Happy New Year 2011!